There is nothing I love to serve more at a gathering than a gorgeous chartruterie board. I feel like there is an anatomy to creating a well rounded and beautiful board. Here are some of the tips and tricks I’ve found make the process super simple! To start, you need to decide how large of a board you are going to fill. I have three different sizes on hand. It’s nice to have a couple to feed larger or smaller groups. For this particular gathering I was hosting I wanted my largest board. I love this one because of it’s handles to make serving super easy. There are countless pairings you can do when it comes to what you add to the board. I like to include a couple staples and favorites or at least categories. You will want to have a variety crackers, meats, nuts, dry and fresh fruit, pickles, olives and garnish. I like to have around 3 types of each category. I included every day finds all from Trader Joes. Place three white ramekins in a triangle shape in the center of the board about 2 inches apart. Add the cheese next to each cracker pile. I like to make sure the lighter colored crackers are paired with the darker cheeses to make a contrast in color. For example, pair the Stilton next to the Fig and Olive crisps and the soaked Toscano with the plum edges next to the Rosemary crackers. Next add in the meats. I like to fold and twist the slices to make them look less stiff. Tuck in the pieces next to the cheeses. Divide the pear slices and fan them in a pile on opposite sides of each other on the board. Do the same with the dried apricots. The fruit will create a cross if looking down on the board. You should be getting fairly full by this point with just a couple holes. You can easily fill the holes with little clusters of nuts and dried cranberries. Fill each of the ramekins with the olives, pomegranates and pickles. Tuck in the rosemary and sage for pops of green. We have a lot of little guys we shop for this time of year. A total 6 boys in all ages. We love gathering some fun ideas for our cousins. The girls love outdoor activities so we keep our focus on outside fun for our picks. We imagine lots of puddle splashing in these rain boots and camo vest. They can set up a fun backyard camp complete with walkie talkies and camping story book for boys night. The girls have this laser tag set and we think it’s hilarious! It’s one of Erik’s favorites. This kids size golf set is perfect for the little budding athlete. Lastly the endless fun to be had with this kids razor and helmet. We had a really fun time getting together the girls’s picks this year. Dance has become a big hobby so we focused on dance gear a lot. They chose new hip hop shoes, tops for jazz, water bottles, caboodle for show makeup and personalized gold dance bags. Capri has shown some major interest in drawing and is actually a pretty good little artist so we added in some cartooning books and fancy colored pencils. We couldn’t pass up some serious Disney swag like sparkly gold Mickey earrings for Peyton and sparkly Minnie ears for our Disneyland trips. We thought this pink electric scooter was the coolest along with sparkly cozy things like this metallic moto jacket and faire aisle sweater. You will be the belle of your Thanksgiving ball with this fall inspired Spinach Artichoke Pizza! I whipped up this bad boy for our Friendsgiving lunch and it was our number one hit with close second being this Spicy Butternut Squash and bacon option. I love the ease of a flatbread style pizza and I tweaked my main recipe a handful to keep my time and mess as low key as possible. I literally got all my ingredients from Trader Joe’s! Make sure to check out my doctored up, easy peasy stuffing from last year! You won’t be sad about it! In a medium saucepain on medium low heat, add in your butter to melt. Once melted toss in your garlic and red pepper flakes. Stir frequently for about 1 minute. Whisk in flour for 1 minute. Slowly add the milk and half and half constantly whisking. Add in salt, pepper, and paprika. As sauce gets thicker, turn up the heat a bit and cook for 2 minutes. Whisk in the cream cheese and parmesan until all melted. Remove from heat and allow to cool. Line a baking sheet with parchment paper to keep clean up a cinch. Lay your pizza crust on the parchment paper. Spread the warm sauce over the top, then half of the mozzarella cheese. Add the chicken, spinach and artichoke. Finish her off with the last of the mozzarella. Slide the pizza into the over for about 12 minutes or until all cheese is melted and golden. Sprinkle with shaved parmesan and grated parmesan. Let cool slightly before topping your favorite cheese board with this beauty. Slice and enjoy! I gathered up all the prettiest dresses, accessories, outerwear and shoes for your little ladies. Nothing cuter than a little girl who feels fancy! These picks are great for a fancy Nutcracker evening, Christmas day or a holiday party. Time to spoil those mamas in our lives wether it be our own mom or our mother in law. These ladies are such MVPs! Help make them feel pampered with cozy slippers or personalized scarf, loved with a personalized calendar filled with your family pictures, and pampered with a pretty bauble or luxurious fragrance. Teachers can be tricky to shop for! I always want to give them something special but not to personal. Tough!! This year a lot of you were requesting a guide for teachers gifts and I was up to the challenge. I’ve gathered up all the best gifts at super reasonable prices to spoil your kiddlets teacher. From classroom treats to yummy sweets to beauty indulgences, I’ve got you covered! We all have that one lady on our shopping list that is tricky. The friend who seems to have everything, the mother in law you want to make a good impression on, the little ladies that you don’t want to have any more toys or the bridal party that you want to spoil. I have you covered this year with the most luxurious gift for any and all of those ladies. Plum Pretty Sugar is the ultimate gift for anyone looking to give something special. Plum Pretty Sugar has created the most gorgeous feminine loungewear with the softest materials. I feel like a princess padding around my house in these stunning pieces. Having something pretty to slip into for the day really sets the tone. From robes to pajama short sets to bridesmaid dresses, Plum Pretty Sugar has a little treasure for everyone on your shopping list. We are getting to the age with the girls where they are wanting to be big girls and be like mommy. When I saw these sweet mini versions of this lavender lace robe, I just about died. They felt so fancy in their special peices. These luxurious robes are perfect for matching sister sets or bridesmaid robes. As I’ve gotten older I have grown to value my friedships so much! I have gathered quite a group of different ladies as my inner circle but man are they all crazy special to me in their own ways. I wanted to celebrate these girls with a Friendsgiving lunch. 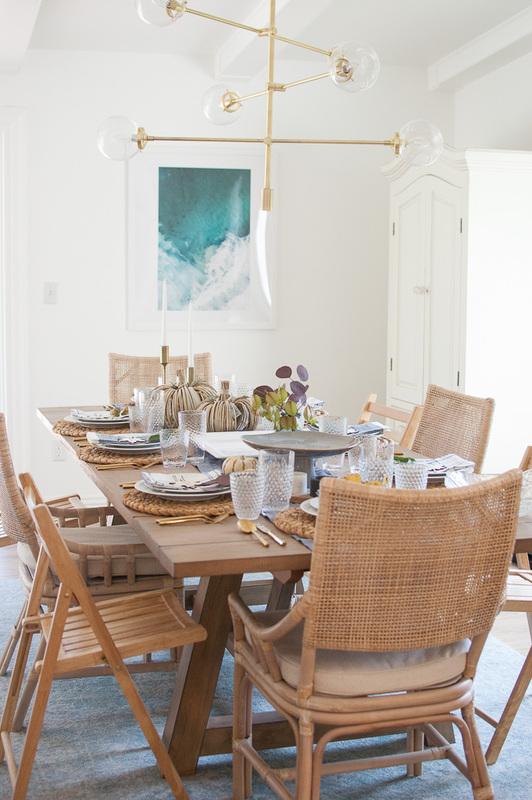 After visiting Napa a couple months back, I’ve been in love with the easy breezy entertaining style of that area. I envisioned a menu full of Thanksgiving flavor but all family style. I wanted this lunch to be no fuss but still fall inspired. I chose a variety of flat breads and yummy mixed salads. For our setting, I made soft blues and rustic tans my main pallet. I added foliage from my yard to give settle pops of color. A coastal feel always is my go to favorite so of course we added some of that ambiance with crisp white china and stripped napkins. My favorite fall accent was the sweet custom made maple leaf place cards from Delovely Designs. I think any custom element makes guests feel like you put in some extra love for them and it works as a great little party favor. The holiday season has fully commenced and I am in major hostess with the hostess mood! To kick off November, I am hosting some of my favorite girls to a luncheon for Friendsgiving. I love setting beautiful tables. I feel like the effort really sets the tone for the party and let’s your guests feel how important they are to you by making it pretty. Over the years I have gathered some tried and true staples to make any table theme gorgeous. 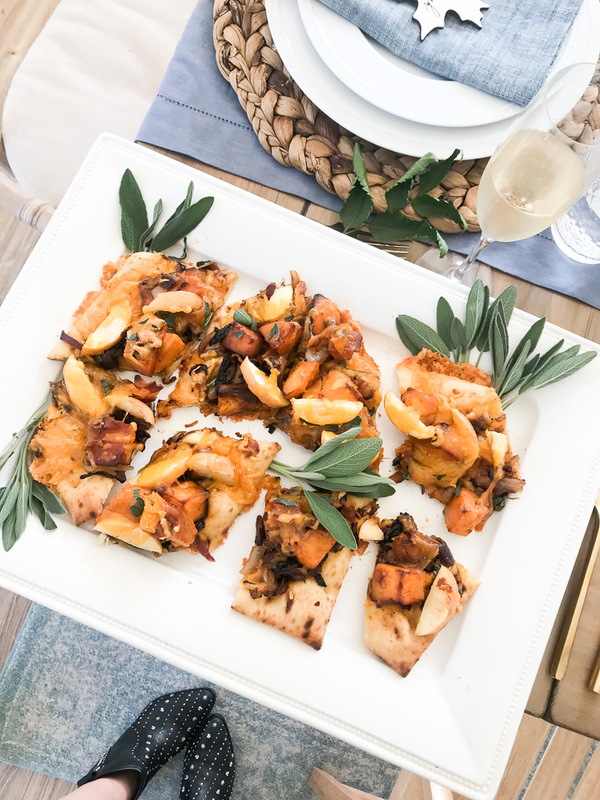 Here is my round up of home entertaining holiday essentials that work with any season and feel. Gold flatware goes with everything for every season. I grabbed 6 settings of this gorgeous flatware last year and find they are all I use now for entertaining. They elevate any place setting and give it a little shine with a modern design. Candle sticks add a little height and drama to your table. I like level changes through my settings. Simple candle sicks allow guests to still see each other but get some ambiance. Serving bowls and platters are the most basic essential in setting any table for a gathering. No matter if it’s a potluck or a full spread it is lovely to have a cohesive feel to your serveware. I like to mix strong white peices with airy glass bowls for salads. Versatile drink ware can both serve for everyday use or for any gathering. I keep a nicer set of plastic cups both big and small on our exposed shelves. They look pretty and are super handy to grab when entertaining. Basic white china can be mixed and mingled any way you like. I registered for this beaded white china for our wedding and still use it for every gathering 11 years later. It’s simple yet the beaded rims add a little sweetness to my tables without being to distracting. Lots of seating is a must! We just updated our dining room and have capacity for 8-10 seats at our new dining table. I keep a handful of extra chairs that match tucked away for occasions with more guests. That way you don’t always need to keep the leafs out on your dining table but are able to accommodate extra guests if needed. Cheese boards are the chicest appetizer display in my book. If you have been following my Insta stories you know I am having a complete obsession with charterturie boards. They are perfect in any setting. Speaking of snacks, make sure to have plenty of cute snack bowls available to add to your cheese boards, scatter around the house or add to your tables for smaller condiments. It's a sparkling fresh new year and time for new goals and dreams! One of my best friends is a major promoter of vision boards. I make pretty thorough goals for myself throughout the year but never have made a vision board. We thought how fun would it be to do our vision boards together and have a couple more of our favorite ladies play too. It became a thing! Goal Gathering! I like a name for get togethers! We kept our gathering small and intimate with just 4 of us. I put together a Charcuterie board with yummy snacks and we sipped on mini Chandon splits. A couple of the girls have done intense courses on goal planning for their businesses and helped create a format for both our big goal lists and our vision boards. We broke down the goals into categories. Family: to encompass anything family or relationship related. This would include family camping trips, quality time with each child, date nights or getaways with your hubby, lunch dates with parents, special notes and coffee dates with friends, etc. Spiritual: faith based goals like incorporating a daily devotional into your morning routine, attending a women's bible study, making Sunday's a priority to attend church, read faith based books, etc. Physical: this could be the obvious like getting back to the gym or cleaning up your eating. This category could also be things like bleaching your teeth regularly,trying that new haircut you have been eyeing, doing weekly at home masks or practicing yoga daily. Educational: this category could be business related or personal development related. I am going to take an official photography class to learn more about my camera. You could make it a goal to go back to school, attend conferences in your field or reading educational books like biographies or biz books. Business /Work: this category can include your work goals for promotion or even little goals like keeping your office drawers organized regularly. Material things: this is a bigger category. This would include the material things or projects you are aiming to gain or finish in the year. This category can also include getting debt free or adding to your savings. Some of my material goals this year are to add built ins and a powder room to the house. I also want to create my garden this year. Then you get to my favorite part! The vision board making! I am super visual person and really get inspired by beauty. We chose our most powerful goals for the year and found inspiring images for each from Pinterest. We all found the most inspiration from pins we have already gathered on our boards. We then used Canva.com templates to upload our images and create our beautiful vision boards. I hope you are more than inspired throughout the year to attain your goals and dreams! I am a huge goal setter and believe in 1, 5, 10 year goals! I'd love to see your vision boards too! If you create one add it to Instagram and tag me in it! Cheers to a gorgeous 2018! I love Champagne and can't wait to ring in the new year with my favorite people! In order to pop only the best bubbly correctly, I asked my adorable sorority little sis and champagne professional ( no really!! it's her career! ) Alissa to help me guide you through the best champagne for your 2018 celebration. 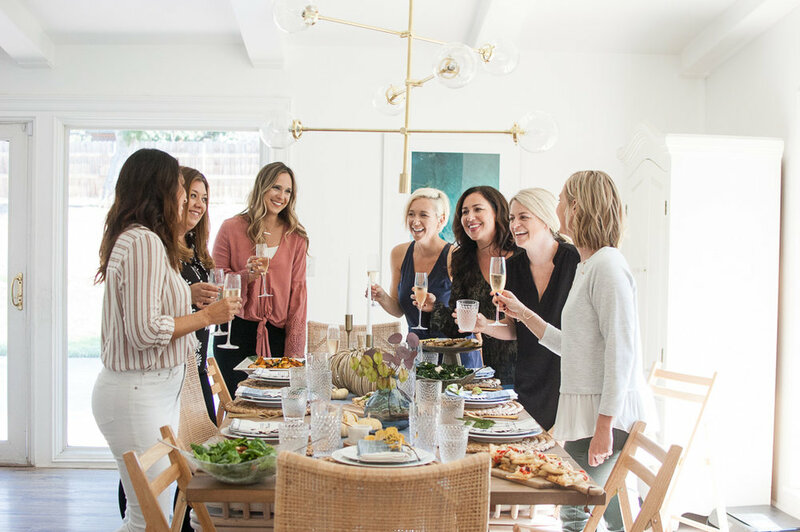 She rounded up the best champs priced from lowest to highest, gave us the scoop on each selection, food pairing and party tips for how to make sure you are prepared to be the perfect hostess! Don't miss the best champs fun facts at the end! My favorite part! Etoile, French for Star, is the Prestige offering from Domaine Chandon. A hugely food friendly sparkling and presented in an exquisite bottle with long neck and simple gold writing. this is an awesome, esoteric offering and one that is splendidly priced for gifting. When selecting your Champagne for this holiday season, it is definitely a good idea to look around for the best price available. Champagne and sparkling are an affordable luxury and if you are going to splurge a little ….. now is the time to do so. From Big box chains, to your local grocery store, to independent wine and spirits shops, and yes even online only stores…. everyone is offering their best foot forward when it comes to pricing and availability this time of year. Some helpful hints and tips: Above is a list of some of the world's most loved bubbles. Including the oldest Champagne house, as well as the very first Sparkling Winery from Napa and of course Champagne Royalty …. KRUG and the beloved Dom Perignon. When looking for Champagne for your holiday gathering it is a good idea to keep a few things in mind when shopping around on price. 1) Number of people in attendance- each 750ml bottle of Champagne will provide approximately 5-6 glasses. If you are having a small party of 2 or a large gathering of 100 there is a Champagne for you and a size to match. Sizes include individual "mini" bottles in 187ml (Moet & Chandon and Domaine Chandon) "Half Bottles" 375ml (Moet & Chandon, Veuve Clicquot, Ruinart, KRUG) or Large formats such as the "Magnum" 1.5L or the equivalent to 2 regular 750ml bottles(Domaine Chandon, Moet & Chandon, Veuve Clicquot, Ruinart Blanc de Blancs, Dom Perignon, and KRUG)..
2)Who is your audience and what is on the menu? : will your guests be simply toasting to the New Year or do you have a home filled with wine aficionado's? Champagne LOVES food so if your group falls into the later category…. your menu will be a huge help in your selection. If you are having lighter fare such as Turkey, Fish, Vegetarian or Vegan…. a brut or Blancs de Blancs will be the true companion to your spread. Should your menu include items such as red meat, lamb, pork, or items with hearty sauces…. then Rose will truly be the perfect choice to wow your guests whether they be Sommelier's or first time Champagne Sippers. 3) Have FUN! Champagne is a beautiful way to not just celebrate the holidays but the everyday and the people you are with. It is truly unique in that it can be carried from welcome, to appetizers. Main dishes, desserts and of course ringing in the New Year. I sat down a couple weeks back after a lot of nagging from my husband for my Christmas wish list. I just couldn't think of anything tangible that I wanted. We typically don't exchange gifts, but this year decided it would be a fun change. I thought and thought about all the little things that I wanted and just didn't come up with anything that I cared that much about. It made me realize that what I really wanted for Christmas was time together. Isn't that the most precious thing you can give another person, is your time? Erik and I both have very busy schedules. To be honest ,we more often times than not, feel like strangers passing in the night. One heading this direction and one running in that direction. School, homework, dance, work etc etc etc. A law enforcement life sorta looks like that and definitely a family with young kids does. I can't say that I have anything to complain about because if anything it has taught me to prioritize our time and really value what time we do have. If that means, missing events or scheduling a date night weeks in advance, then that is what it is. We have luckily made it work but not without effort. If you have followed my insta stories for some time you know how many times, I look over to see my romantic movie night partner dead asleep. So this Christmas, I asked for time. I've asked for a long drive to a explore a new city. I've asked for a night of playing cards by the fire. Just slow, quality time to connect. Cheers to you and your loved ones getting that quiet time to focus on each other and create priceless memories. I've adopted Chocolate Crinkle cookies as our family's official Christmas cookie. I know, very dramatic! I just think they are the prettiest little things! Not to mention, they are beyond delish. Like a fluffy brownie! We make a whole assembly line of these beauties and have fun wrapping them all up for our neighbors. A couple years back, we topped them with crushed candy canes and stacked them in mason jars with pretty ribbon. Last year, I scored some adorable galvanized buckets from the dollar bin at Target and layered them inside. This year, I found some sweet,snowflake adorned baking dishes and we are wrapping them up in fluffy cellophane and blue glittery bows. It's all in the presentation! I included the recipe below for these babies! Combine the unsweetened chocolate and the butter in the top of a double boiler pan or heatproof bowl. Set over simmering water and stir until the chocolate and butter are melted and smooth. Remove from the heat and let cool slightly. In a large bowl, using an electric mixer on med. speed, beat the eggs, granulated sugar, and vanilla until light in color and thick, about 3 minutes. Add the melted chocolate mix and beat until blended. In a bowl, stir together the flour, cocoa powder, baking powder and salt. Add the flour mixture to the chocolate mixture and beat until blended. Mix in the chocolate chips. Cover the bowl and refrigerate for about 2 hours. Rol rounded tablespoonfuls of the dough into 1 1/2 inch balls. Roll each ball in the powdered sugar to coat completely. Arrange the balls on baking sheets about 3 inches apart. Bake the bookies for about 13-17 minutes or until tops are puffed and crinkled. Let cooked cool on baking sheet on wire rack for 5 minutes. I am so giddy with my shopping picks this year for the girls! We aren't a big toy family and the girls rarely get gifts outside of their birthday and Christmas. I found some of the cutest presents this year that I can't wait to surprise them with! Here are some of my favorites! 1. iPod Nano- if you have followed my Insta Stories you are familiar with Peyton's epic dance shows we get each night. I am so excited to load up all her favorite tunes for her to rock out with. 2. Polaroid Instax Mini - Capri went to her dance competition team party a couple months back and I really wanted her to be able to take pictures of her and her friends since mommy's weren't allowed. This is the perfect camera for her for next time! 3. Mind Blowing Science kit- I love interactive, activity gifts. This kit has tons of cool learning projects. Perfect for school age boys and girls who have everything. 4. Mancala- BEST board game ever! 5. Luminous Skateboard- a skateboard that lights up! I mean.....no more discussion! 6. Teepee- perfect for the little ones to snuggle in with their books and toys. My girls still love having slumber parties their big teepee at nana's house! So cozy! 7. Off Broadway puppet theater and Medevil puppets- so adorable for any age! Create your own show and work that imagination! 8. Lemonade cart- The girls LOVE selling lemonade and other odds and ends in the summer. This cart makes their little entrepreneur endeavors all the more official. 9. LIFE board game- this has quickly become one of our family's favorite game night picks. 10. Kids Kayak- This gift makes me so excited! This will be Capri's big Santa gift. We visit Balboa Island often and each time we visit she befriends any kids that have one of these kayaks. Eventually she hijacks it completely. Now she has her own to adventure with! One of my most favorite traditions with the kids is gingerbread house making. We have done it since they were super little and it' the perfect way to kick off the holiday! This year had to be my most favorite! The girls are at that sweet age where they are creative and can enjoy the process. In the past, I've made the rookie mistake of buying the non preassembled houses. You know, the one with all the house pieces flat in the box and a big 'ol frosting pouch. I don't care what the directions say, you need to be an engineer to get that nonsense to stick and the house stand up! So of course in my busyness I grabbed the non assembled from Target. NOOOO!!! The directions assured me, this would be a cinch! Assemble in minutes they say! This was a 20 minute, two man job! Once we got the houses in order, it was go time and mommy could sit back and let the decorating fly. Peyton eats more than she decorates and Capri is very into excessive decor. I had a great time making the table festive! I grabbed up sweet Target Dollar Bin pine tree and Bottle brush trees, candy jars and festive ramekins to hold treats. I can across this adorable sleigh serving platter and used it for our chocolate milks. We pumped our Christmas tunes and mommy's heart was full! We have made a fun tradition of surprising the girls iwht their Christmas pajamas each year. In years past we add in a fun holiday movie also for a family night. We have had cookies and popcorn with The Polar Express. Hot cocoa and sweet treats paired perfectly last year with Elf. This year I had a hard time finding an age appropriate movie, so I opted for some new books! Some of our all time favorites are "What to do with an idea" by Kobi Yamada, "Lily the Unicorn" by Dallas Clayton and "Girl Power short stories" by various authors.